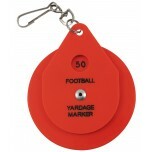 Accurately mark your chain with a referee chain clip with distance and yard location before measuring for first down. 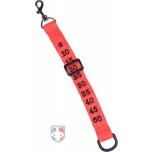 Choose from plastic-dial or more popular cloth-slide. Not a bad chain clip. I believe this is the best style of chain clips and recommend the style over any other. The quality is lacking for the price, but if you are a new official it will work! Good product - the snap is easier than a clip and the slider is quicker and easier to see than the dial models.